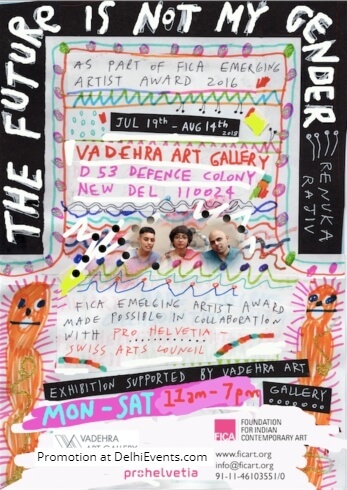 Rajiv was recipient of the Emerging Artist Award (EAA) 2016, an annual grant for promising young artists, awarded by FICA in collaboration with Pro Helvetia – Swiss Arts Council. The exhibition is a culmination of the Award process including a three-month residency in Switzerland in 2017. Renuka studied digital video production at Srishti School of Art, Design and Technology, and later went on to do a BFA (Hons) in Printmaking at Victorian College of Arts in Melbourne in 2010. Since their return to India, the artist has had a constant engagement with different materials - making sculptures, textile works, paintings, drawings, zines, installations, animations and artist books – foregrounding 'spontaneity, immediacy and imperfection'. Their practice embodies a conceptual rigour and an inventive provocative aesthetic(s) that critically chronicles and comments on matters of sexuality, gender, physicality, notions of family and relationships, via personal narratives. The works in the exhibition bring together old and new explorations as Renuka reconnects with childhood interests of playing with fabric and paper - exploring drawing, paper maché, tie-dye and embroidery. With an interest in the hand-made, their work inhabits a space that accommodates the imaginative, observational and autobiographical. THE FUTURE IS NOT MY GENDER includes a large body of textile and embroidery works, sculptures, as well as twenty-four monotypes selected from a larger series of three hundred prints. Renuka describes the prints as a cathartic series that they made while living in Melbourne - daily renderings that reflected their ‘state of mind’. The fabric works are mostly made with old garments of family and friends, and for Renuka the labour-intensive process of working with embroidery is an interesting contrast to the drawings and prints which are spontaneous in comparison. The challenge was about slowing down the process and creating a teeming surface replete with thread-lines and patterns, figurative and abstract elements, and imagery interspersed with verbal interjections. In thought-provoking ways they conjure up a multitude of references – the energy and life of folk and indigenous art, the irreverence of zines, the eccentric and compulsive note-making of an artist. The small sculptural pieces are also an extension of these exercises, made out of cloth and paper maché, the latter made from recycling the waste paper generated during their residency in Lucerne. “This is a collection of old and new works expressing internal worlds and intimate interactions. I love to be a narrator. My need for the visual arises from my need to communicate, but this need to communicate remains outside the realm of verbal languages. It is a visual world that is reluctant to be written about, yet intent to reach out. This is a moment in a long-term exploration of expressing the aspects of my reality that are outside the material world. I am interested in the continuity and interplay between narrative and pattern. Seats are limited in number. Please register for this workshop at info@ficart.org. About the Artist: Renuka Rajiv is an artist based in Bangalore. They did a diploma in Digital Video Production from Srishti School of Design, Bangalore, India (2007) and Bachelor of Fine Art, Printmaking from VCA, Melbourne (2010). They have participated in several group shows in Melbourne, Kochi, New Delhi and Bangalore. Their solo exhibitions include Life As a Solo, Handheld Gallery, Melbourne (2013); Wild Fermentation, Brunswick Artspace, Melbourne (2013); Static/Problematic, G159, Bangalore (2015). Renuka was artist in residence at CONA, Mumbai funded by INLAKS Shivdasani Foundation (2014), TAJ Residency/ SKE Projects, Bangalore, (2015) and Walkin Studios, Bangalore (2015). Their publications include Silicon Plateau #01, a collaborative publishing project between T.A.J. Residency/SKE Projects + or-bits.com in 2015. They have received the City of Stonington Print Prize in 2010; the NGV Women’s Association Prize in 2010 and the Substation travelling exhibition prize in 2011. As part of the FICA Emerging Artist Award 2016, Renuka undertook a ninety-day residency at Lucerrne University of Applied Sciences and Arts between September and December 2017.